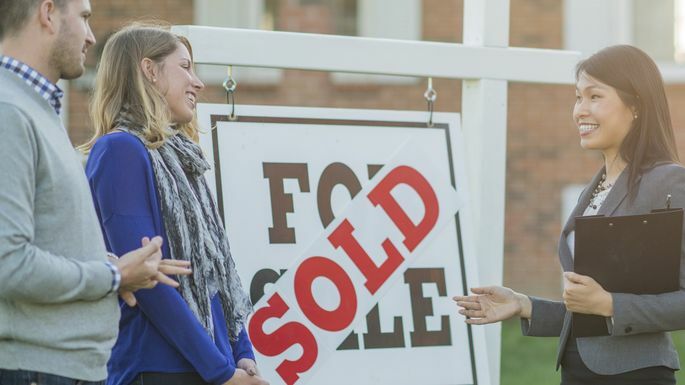 Becoming exclusive with a real estate agent is similar to going steady—you make an agreement to stick with the same person. When you sign an agreement with one sole real estate agent to sell your house, your property is considered an exclusive agency listing. Your broker will have the right to sell the home for a specific, mutually agreed-upon amount of time and compensation. “The word ‘exclusive’ makes it seem limited, but it is actually the opposite,” says Ashlie Roberson, a real estate agent at TripleMint, a New York City brokerage. “Exclusives can get you more exposure, thus more possible offers. Exclusive agreements can say anything, and time and compensation are not set in stone. Many agents will ask for a six-month exclusive, but if you’re in a seller’s market with low housing inventory, agents might be more willing to take a shorter exclusive. That said, there are two different primary types of exclusive listing agreements: the exclusive right-to-sell agreement and the exclusive agency agreement. By signing an exclusive right-to-sell agreement, a seller agrees to compensate the listing agent who finds a buyer, “regardless of whether the property is sold through the efforts of the listing broker, the seller, or anyone else,” according to the National Association of Realtors®. The only exception to the seller having to pay commission? If an individual is named as an exemption in the listing agreement and if the house is sold to this person, the seller does not have to pay commission to the listing broker. For example, let’s say the seller lists a niece as an exemption and this niece ends up buying the house, the seller is not obligated to pay the listing agent commission. In this type of agreement, the seller agrees to pay the listing agent if the house is sold through the efforts of any real estate broker. However, if the home sells solely through the efforts of the seller, then the seller is not on the hook to pay commission to the listing broker. Should your home be an exclusive listing? At face value, signing any type of exclusive agreement might sound limiting to a seller. But agents will tell you that signing an exclusive can sometimes be akin to letting a racehorse run free. When agents know a listing is exclusively theirs, they will give it everything they’ve got to sell the property. That could mean syndicating the listing to the entire broker community, spending money on marketing, or hosting a wine-and-cheese broker open house. Before signing, read your exclusive agreement to make sure it has a cancellation or termination clause that lets you end the agreement if you take the property off the market or just aren’t satisfied with the job your agent is doing. Some agreements require the seller to pay a “buy-out” fee or compensate the broker for out-of-pocket marketing expenses. Bottom line: Make sure you understand the exclusive contract you sign, and don’t sign an agreement that doesn’t suit your needs.